NICOLE Vaidisova was 12 when she first saw Serena Williams warp tennis balls in the flesh. Five years later the American powerhouse is Vaidisova's last barrier to a maiden grand slam final. Nice look at Nicole Vaidisova and Tatiana Golovin, with bits on Sania Mirza and Shahar Pe'er. Bolletieri ball-banger Nicole Vaidisova (News/Posts) is blogging from Stanford this week for the WTA. What we've learned so far? She loves playing World Team Tennis, watching Alien v. Predator, and has a sense of humor. Read her blog. 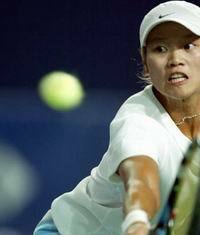 Biggest story of the day: 27th seed Li Na of China upset big-hitting 10th seed Nicole Vaidisova (News/Posts) to become the first Chinese singles player ever--male or female-to make the quarterfinals of a major. She faces #2 seed Kim Clijsters tomorrow, and I say she's got a shot. Here are a match summary / Vaidisova's interview / Li's interview. Upset of the Day: Today's biggest upset actually comes from doubles--the world number 1 team Lisa Raymond and Sam Stosur were dismissed 6-4 6-4 by 8-time Grand Slam champions Virginia Ruano-Pascual and Paola Suarez. Closest Shave: Italian Flavia Pennetta lost to Maria Sharapova (News/Posts) in 3 sets. Pennetta (aka Carlos Moya's girlfriend) was playing a thoughtful, full-range game, and maybe should have won it; but as usual Maria simply refused to lose. Here are a match summary / Pennetta's interview / Sharapova's interview. WTF QF-alist: French qualifier Severine Bremond continues her golden run with a win over Hingis-slayer and 18th seed Ai Sugiyama. Here's a match summary. Mauresmo (News/Posts) over Ivanovic (News/Posts) and Myskina (News/Posts) over Venus-slayer Jelena Jankovic. Henin-Hardenne (News/Posts), Dementieva (News/Posts) and Clijsters (News/Posts) are also through. Here's the women's draw. 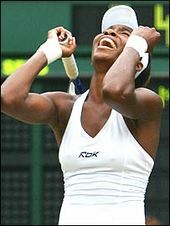 Venus landed at the bottom of Mauresmo's quarter of the draw and so did 14th seed Dinara Safina. Other trouble spots: a newly brunette Tatiana Golovin and Ana Ivanovic who's already beaten Amelie this year. Michaela Krajicek, who's still having a great week in Nottingham, is a potential 2nd round match up for Mauresmo. Sharapova's section looks pretty straightforward until Dementieva in the quarters, though Schiavone, Sania Mirza, and Danilidou, who made the semis at the Ordina Open, could add some spice. Hingis, Hantuchova, Jamea Jackson and Patty Schnyder are in Justine Henin-Hardenne's section of the draw. Will be interesting to see if Hingis can reach the massive roadblock that is Justine. At the bottom of the draw, there are a few threats between #5 seed Kuznetsova and #2 seed Kim Clijsters: Vaidisova, Na Li and Kirilenko. News: Petrova's pulled out with her lingering groin injury from the French. Pretty in-depth look at the rising (or arrived?) Czech. Here it is. "Being born in Germany Steffi Graf was always my idol and my inspiration and I am sure nobody else is ever going to do as well as she did. She had so much class on and off the court. It was a near thing for Svetlana Kuznetzova. Vaidisova had her number, but the Kuze fought back. Here's a match summary. Right now Henin-Hardenne is up a set and a break on Kim Clijsters and is strutting around with some serious confidence. Would be absolutely shocking if Justine loses. Nicole Vaidisova is the only member of the women's final four who hasn't won a grand slam title. The veteran Grand Slam winners were all in attendance at the French Open on Tuesday: Martina Hingis, Venus Williams, Kim Clijsters, Justine Henin-Hardenne and Svetlana Kuznetsova.